Yesterday marked this year’s World Health Day, meaning the World Health Organization (WHO) select a subject of growing concern surrounding global health to focus on and highlight to the world. This year’s chosen topic is food safety. 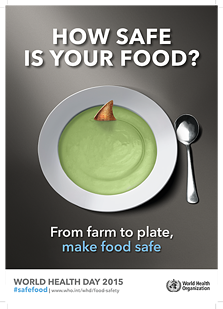 The emphasis is on the entire food safety journey around the world, “from farm to plate,” which means there’s an awful lot of things we could talk about surrounding food safety and health. Have you ever had food poisoning? It’s an illness that shouldn’t be wished on anyone, made all the more bitter because it can, in a lot of cases, be easily avoided. We decided to focus on the end of the food safety chain: “how can I make sure the food I buy and cook is the safest it can be?” We’ve got a few pieces of useful information to help you gain the knowledge needed to avoid the horror that is foodborne illness. Food poisoning, or foodborne illness, occurs when our food becomes contaminated by microbes or toxins. This can happen in a variety of different ways, such as bacteria in dirty water used to wash food, microbes in our preparation environments like kitchen surfaces, or even in the food itself from the beginning, as happens with enterotoxins, which target the intestines in healthy live animals but can cause harm if consumed after slaughter. However, a lot of the bacteria found in food needs to multiply to quite a number before it will have any effect on us. Microbes love the warm and the damp, so leaving your chicken on a table during a humid summer’s day is a party for bacteria. Refrigerating or freezing stops a lot of microbes from multiplying, but unfortunately not all. What are the different kinds of food poisoning? Salmonella - This is one you’ve probably already heard of. There are over 2,500 strains of salmonella, and it can get into almost all your food and drink. This is because it’s present in the guts of animals, most commonly poultry. This in turn means it could contaminate any poultry or dairy products. Any fruit or vegetables that have been in contact with salmonella bacteria through manure used can be affected, as well as water being contaminated through sewage, which in turn affects anything washed with that water. Oh dear. So what can you do about it? Ensure poultry and meats are cooked through to at least 165F and dairy products are pasteurized or cooked. Make sure the water you are washing and preparing with, and of course drinking, is clean. Staphylococcus Aureus - This one is a chef’s worst nightmare, as it is all to do with the preparation and storage of food. Staphylococcus Aureus lives in peoples’ and animals’ skin, hair, everywhere. If those bacteria get onto the food being prepared, and are then left in warm conditions, it will multiply at extremely fast rates, causing the food to become contaminated. Thankfully, this bacteria is easily held off by keeping cold foods cold (below 40F) and hot foods hot (above 140F), as well maintaining squeaky clean hygiene when preparing food. Campylobacter Bacteria - Campylobacter is present mainly on raw meats, but can be transferred when that meat is cross-contaminated with other products or your own mouth. As little as one drop of raw chicken juice is enough to cause this foodborne illness. Simply cooking your meat through to above 165F and avoiding cross contamination will prevent you becoming ill. It’s one to really be mindful of, as it’s the second biggest cause of food poisoning in the US, and can also lead to complications such as Guillain-Barré syndrome. Incuabation periods vary greatly, anything from 1 hour, for staphylococcal poisoning, to up to 10 days for something like Campylobacter. What should I do if I have food poisoning? With vomiting and diarrhea comes a big risk of dehydration, so the most important thing is to keep up your fluids. Most symptoms only last 48-72 hours, so if you are still suffering symptoms after 4 days, see your doctor. If you are not sure whether your symptoms are food poisoning or could be something else, you could run them through a symptom checker such as Isabel, as well trying to think of the food you have eaten over the last week. If you have a high fever, experience bloody stools or signs of dehydration http://www.mayoclinic.org/diseases-conditions/dehydration/basics/symptoms/con-20030056, then you should seek medical attention.